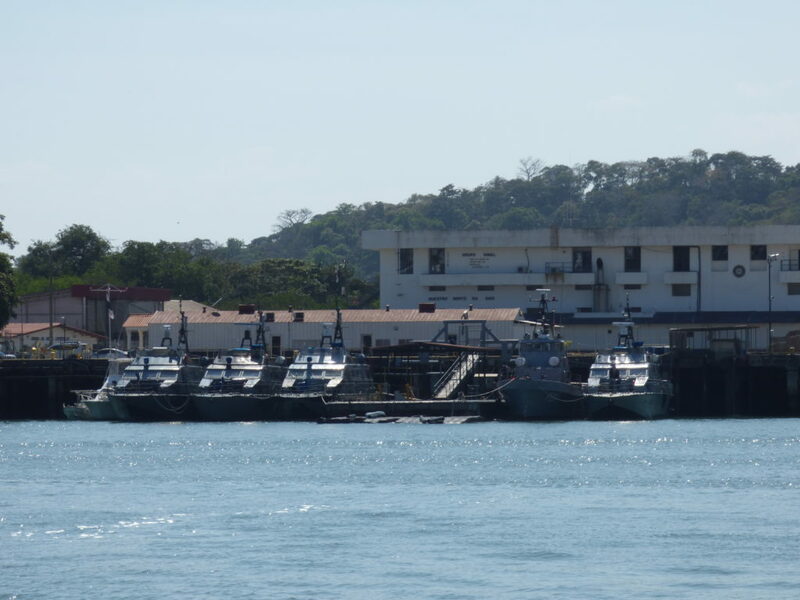 On the port side, just past Miraflores Locks you will see some buildings of the City of Knowledge, occupying the former Fort Clayton US military base. The City of Knowledge Foundation was officially born in July 1999 to house a technology park and international center for scientific research, within a tax-free zone. The Red Cross, United Nations and several US Universities have a presence here. 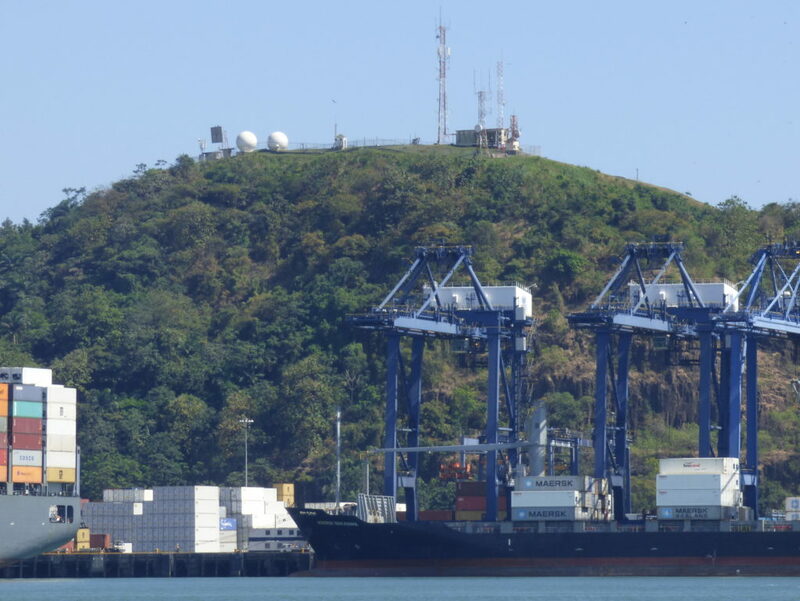 After clearing the Miraflores Locks you will head towards the Bridge of the Americas. On your starboard side you might see a big ship navigating the Pacific access channel associated with the new Cocoli Locks. This 6.1-kilometre channel was excavated to bypass Lake Miraflores, because the new locks are one set of three chambers rather than the separated Pedro Miguel and Miraflores Locks. 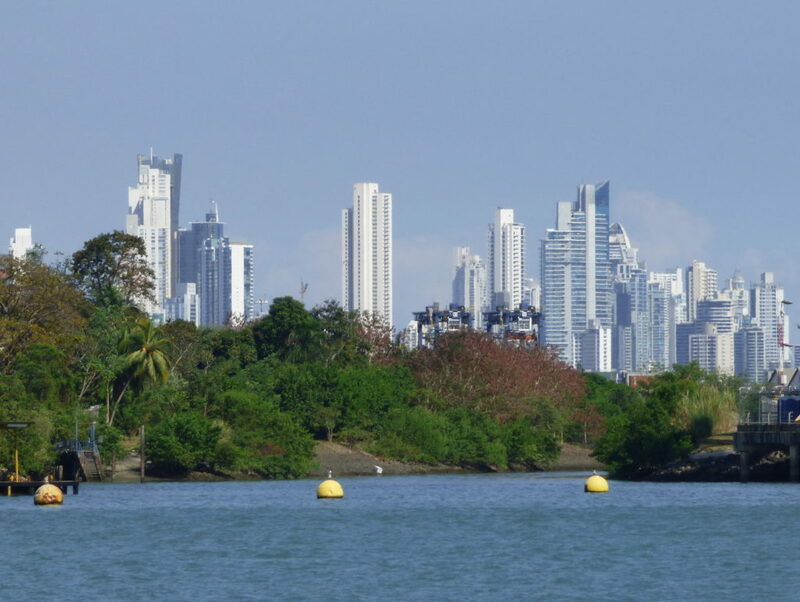 On the port side you will start to see the high-rise buildings of Panama City. 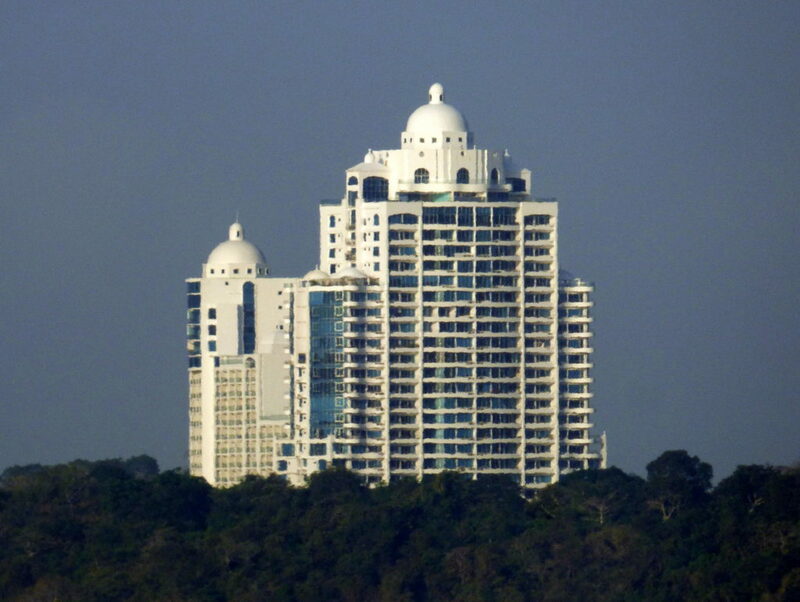 Panama City has the third highest number of skyscrapers in the Americas, more than Miami! Only New York and Chicago have more. 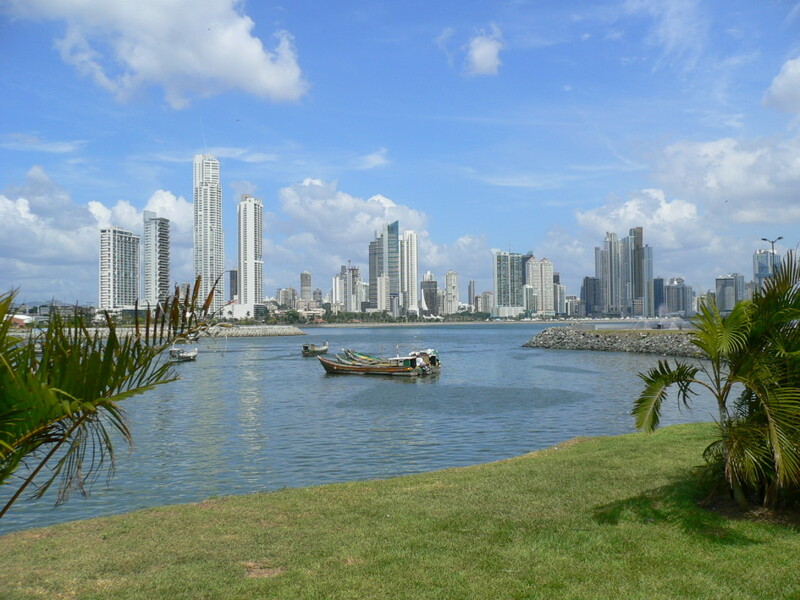 The Republic of Panama has a population of around four million, and a quarter of those live in the Panama urban area. Many of the buildings you can see are residential, owned by people who do not live in the city, especially Columbians and Venezuelans. On your port side you will pass the Port of Balboa, formerly Ancon Port, which was inaugurated in 1909. It was refurbished by the Americans at the beginning of the construction of the Canal from an old French dockage area. 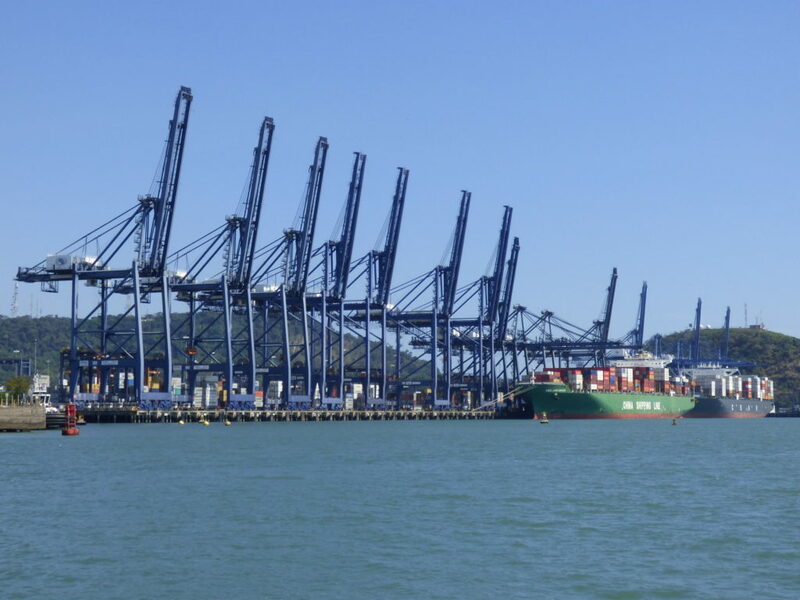 Balboa is the only container terminal in Panama servicing the Pacific region. To starboard you will see that work is in progress to further expand the container capabilities of the port. 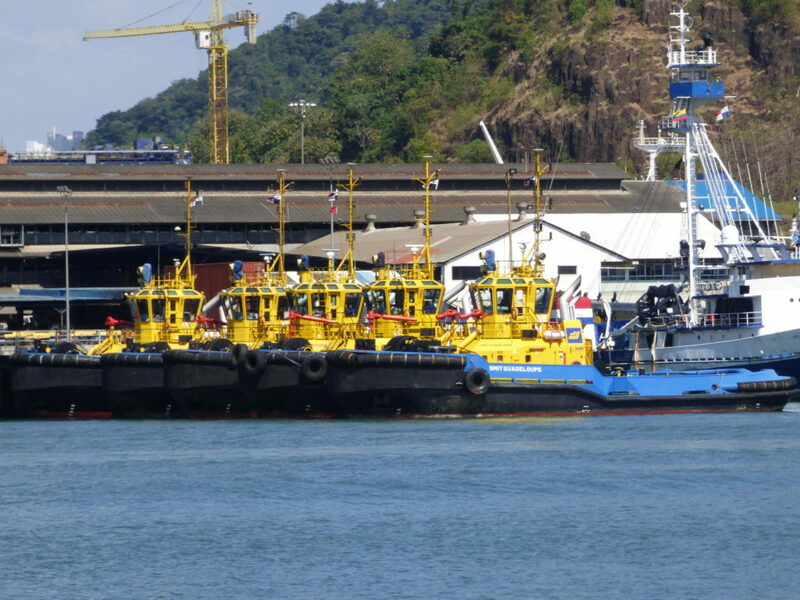 If you see blue and yellow tugs operating in the ports, these are a contracted service by the Panama Port Company (PPC). These mostly handle the large ship traffic in the container ports at either end of the Canal, but sometimes they assist the blue and white ACP tugs. On your starboard side you will see Rodman Naval Station. This was built in 1943 as the 600-acre U.S. Naval Station Panama Canal (Rodman Naval Station), which provided fuel, provisions and other support to military ships passing through the Panama Canal. Until its March 11th, 1999 handover to Panama, Rodman was staffed by over 200 military and civilian personnel. The naval station included a port facility with three docks, 87 housing units, warehouses, industrial areas, an office building, and other facilities. During the Cold War an average of 250 warships passed through the Canal each month. During the Cuban missile crisis (1962 to 1968) blockade efforts were run from Rodman station. At peak strength in the 1990s, 1,000 troops were stationed there. 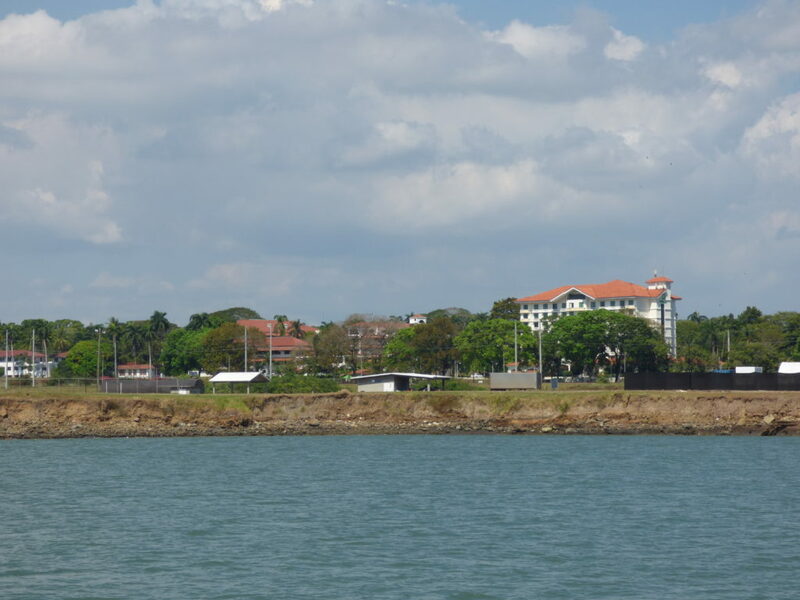 The base is now known as Naval Base Vasco Núñez de Balboa and is used by the National Air and Naval Service of Panama. If you see low-flying aircraft flying above the port they will be arriving or departing from one of the airports close to the Canal. Behind Balboa port you will see a small hill with various antennae and satellite domes. This is Sosa Hill, and the installations are now associated with Marcos A. Gelabert International Airport, which is just behind the hill. It is more commonly known as Albrook Airport, and it primarily services domestic flights including the Perlas Islands off Panama City, but Air Panama also flies to Costa Rica and Colombia. On the starboard side behind the hills is Panama Pacifico International Airport, previously known as Howard Air Force Base. VivaColombia and Wingo airlines operate out of this airport. Further along on the starboard side you should be able to see the buildings of the new expansion locks at Cocoli. The view of the locks will be better if you look behind you after you pass the area. 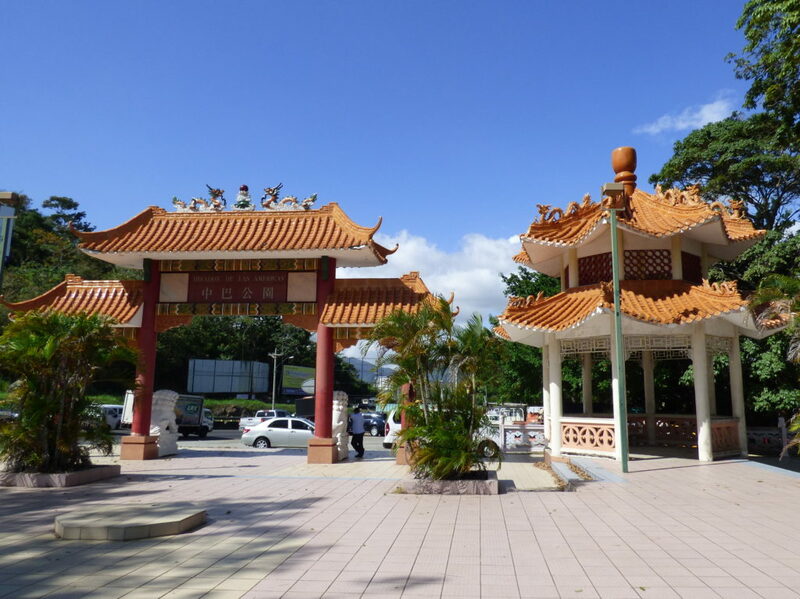 Just before you pass under the Bridge of the Americas, you might see on the starboard side, a monument dedicated to the Chinese community, which has resided in Panama for more than 150 years. (It is below the billboards, hiding in the trees). The first Chinese emigrated from southern China to help build the Panama Railroad in the 19th century. Convenience stores in Panama are known as ‘chinos’, reflecting the fact that many are owned and run by Chinese immigrants. 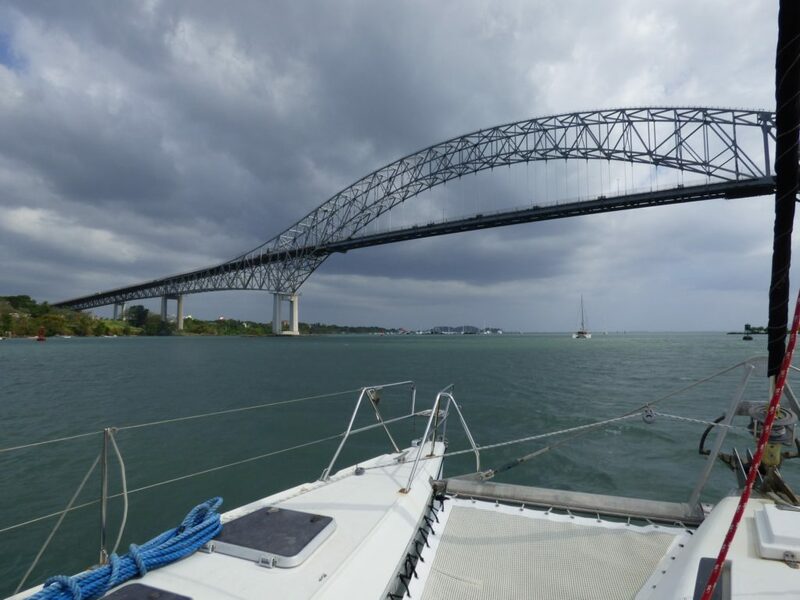 This bridge was completed in 1962 and allows the Pan-American Highway to cross the Panama Canal. Before the construction of The Centennial Bridge in 2004, The Bridge of the Americas was the only road that connected North and South America. It is a cantilever design where the suspended span is a tied arch. The bridge has a total length of 5,425 feet in 14 spans, abutment to abutment. The main span measures 1,128 feet and the tied arch (the centre part of the main span) is 850 feet. The highest point of the bridge is 384 feet above mean sea level; the clearance under the main span is 201 feet at high tide. Now that the locks have been expanded, the height of this bridge has become a limitation on vessels wanting to transit the Canal. The larger cruise ships can fit in the locks but not under the bridge. 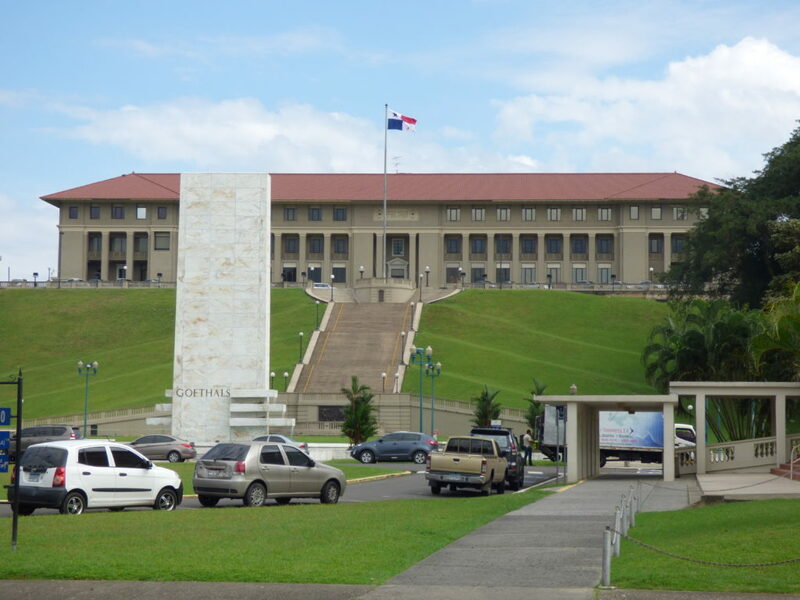 Located behind the Port of Balboa is a large hill with a huge Panamanian flag on the apex. The flag is roughly the size of a basketball court. 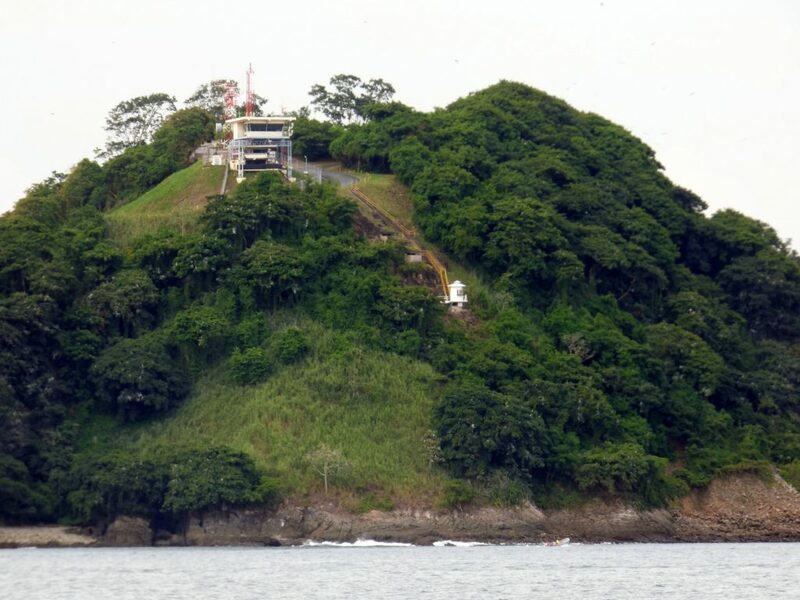 This is Ancon Hill which is the highest natural point in the capital at 199m. It was part of the Canal Zone until 1977. From the top you can experience wonderful vistas of the Canal, Panama City, Casco Antiguo (Old Town) and surrounding areas. If you look very closely past Ancon Hill you should be able to see the ACP Administration building. 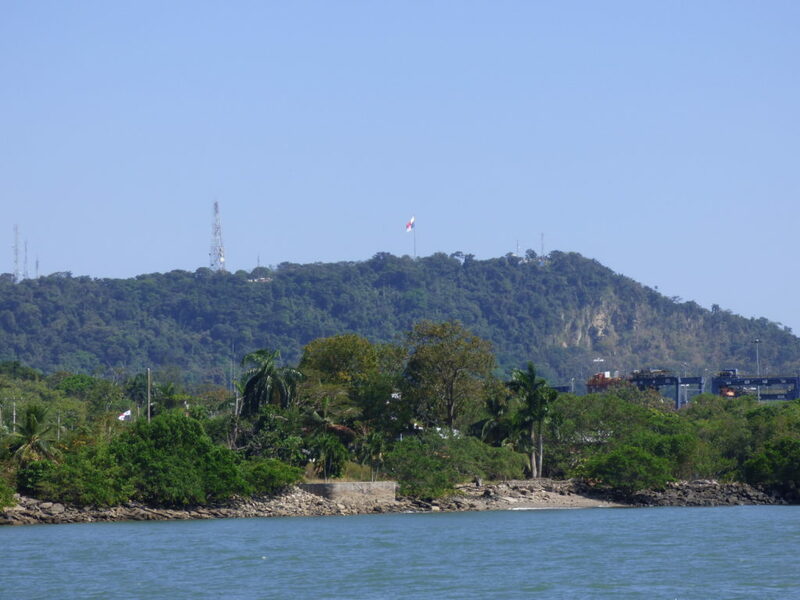 This structure was intentionally built on a man-made mound at the height of 87 feet, which was the theoretical lift from the Pacific and Atlantic to the water level of Lake Gatun. Located directly in front of the administration building is a large open space, which is surrounded by low-rise ACP buildings. The open space represents the exact dimensions of one of the lock’s chambers (110 x 1000 feet). This area was purposely located so that the Canal Administrator can look of his/her office window and appreciate the scale of the lock chambers. After passing beneath the Bridge of the Americas you will see the Balboa Yacht Club on your port side. The club is a popular meeting place for expats and locals alike. The Balboa Yacht Club pretty much denotes the start of the Causeway. This is a very popular area for locals and tourists. The Causeway was constructed with 1,250 million cubic yards of rocks excavated from the original Canal construction, and has recently been widened using rocks from the Canal expansion project. It was designed as a breakwater to protect the entrance to the Canal, but also to prevent sedimentation in the port of Balboa. During WWII the area under the Bridge of the Americas was the US military Fort Amador. The tank farm and numerous buildings further along still exist. 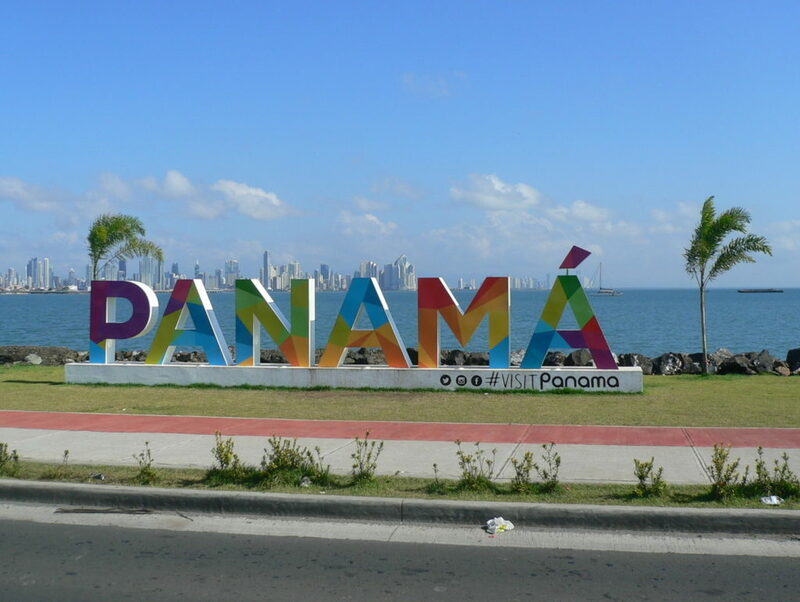 The Causeway provides excellent views of Panama City and there are numerous bars and restaurants located along its six-kilometre length. This colourful sign was originally partway along the causeway, but it was moved to the marina area at the end. Located on the Causeway on your port side you will see the BioMuseum. It is very hard to miss! 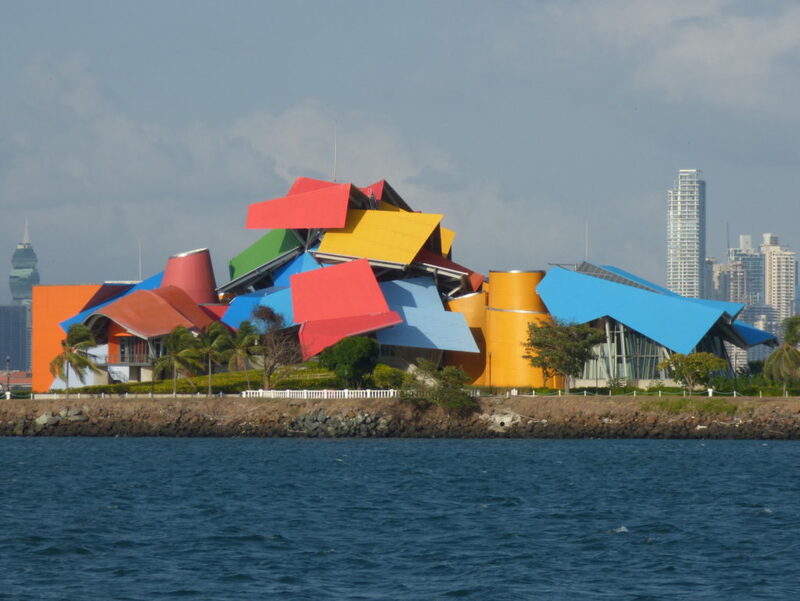 Frank Gehry’s first design for Latin America contains exhibitions mainly relating to Panama’s biodiversity. Also known as Panama Bridge of Life, the building was designed to tell the story of how the Isthmus of Panama rose from the sea, uniting two continents, separating a vast ocean in two, and changing the planet’s biodiversity forever. As always, estimates vary, but the project is estimated to have cost US$90 million. 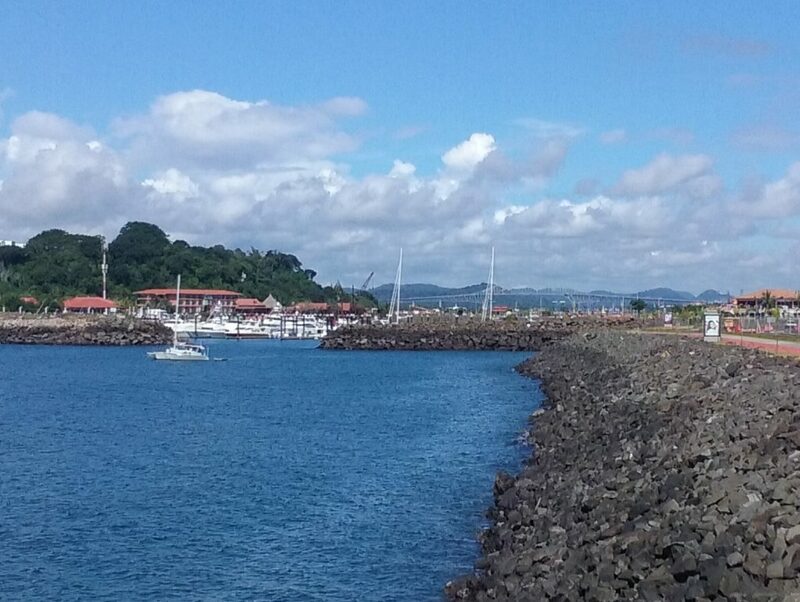 At the end of the Amador Causeway, on your port side, you will see four islands and a couple of marinas. During WWII the islands were part of the US military Fort Grant, and contained numerous gun batteries. After the war the aviation threat grew, so the US military added anti-aircraft missile systems to Flamenco Island. Fort Grant was turned over to Panama in 1979. Naos Island was used by the Panamanian military until 1989. 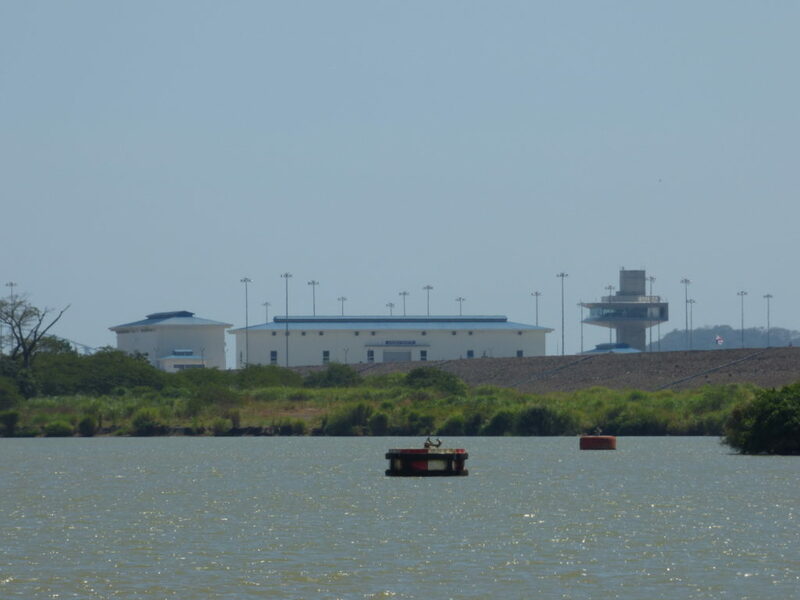 Flamenco Island was used as a prison until 1989, now controlled by the Panamanian Coast Guard. 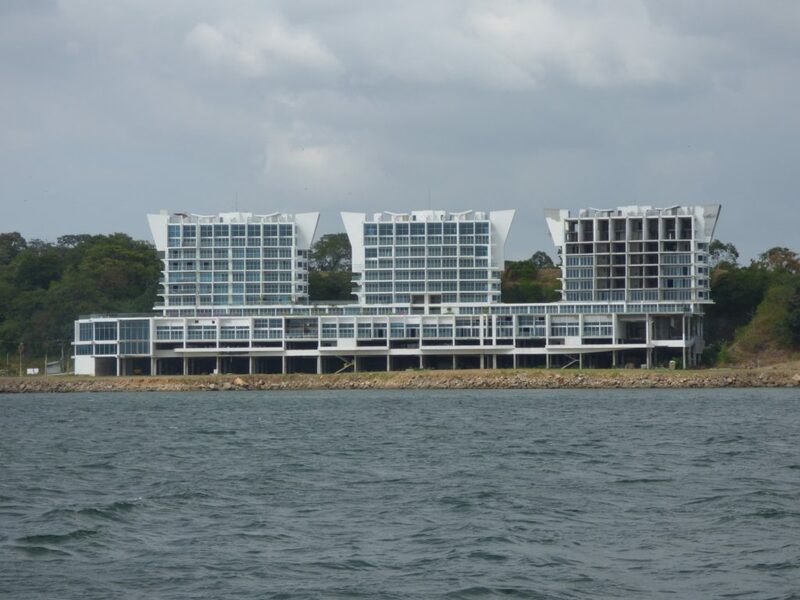 These are luxury condos right on the banks of the Panama Canal. Somewhat expensive for Panama, you are a little isolated from the city, but when the Causeway is more developed they might become valuable. A convention centre is under construction, and there are plans for a cruise ship terminal. General Noriega used to have a luxury house and social club here, but it was destroyed by the US during the 1989 invasion. Just past these condos you will see the little Punta Culebra, which is now a Smithsonian park where you are almost guaranteed to see sloths, iguanas and other animals. To your starboard side you will see the towers of Playa Bonita, a large complex of hotels and condominiums. This is the control tower for the Pacific end of the Panama Canal, monitoring all the ship traffic passing through. To your starboard side a few miles offshore are a few islands, one of which is Taboga Island or the “Island of Flowers”. It was discovered in the 16th century and originally named Isla de San Pedro by the Spanish explorer Vasco Núñez de Balboa. Its current name derives from an Indian word aboga (“many fish”). The island’s first settlers were Indian slaves from Venezuela and Nicaragua. The small town of San Pedro was founded in 1524 by Hernando de Luque, dean of the Panama cathedral. The town church of the same name is claimed to be the second-oldest church in the hemisphere. Rose of Lima (1586–1617), the first Catholic saint of the Americas, may have been born on the island. French painter Paul Gauguin visited the island in 1887. 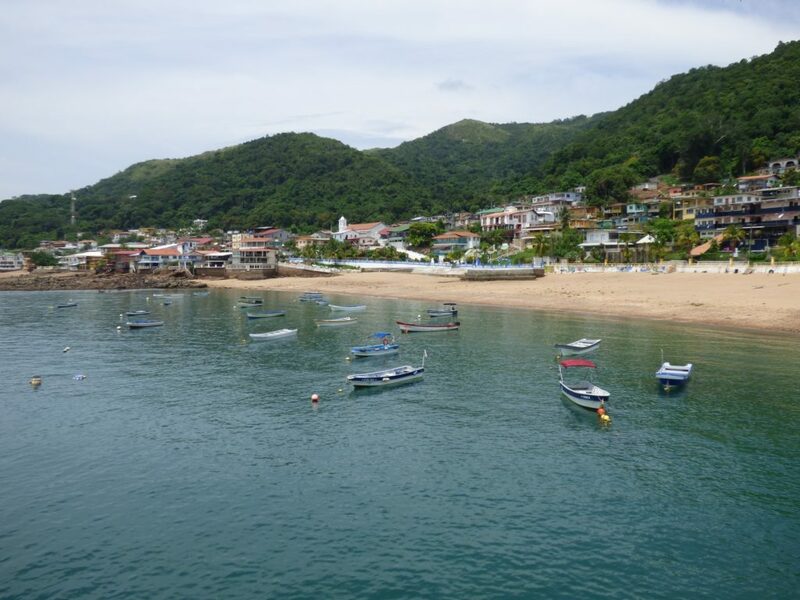 Taboga is now a popular destination for day-trippers and the closest beach to Panama City. 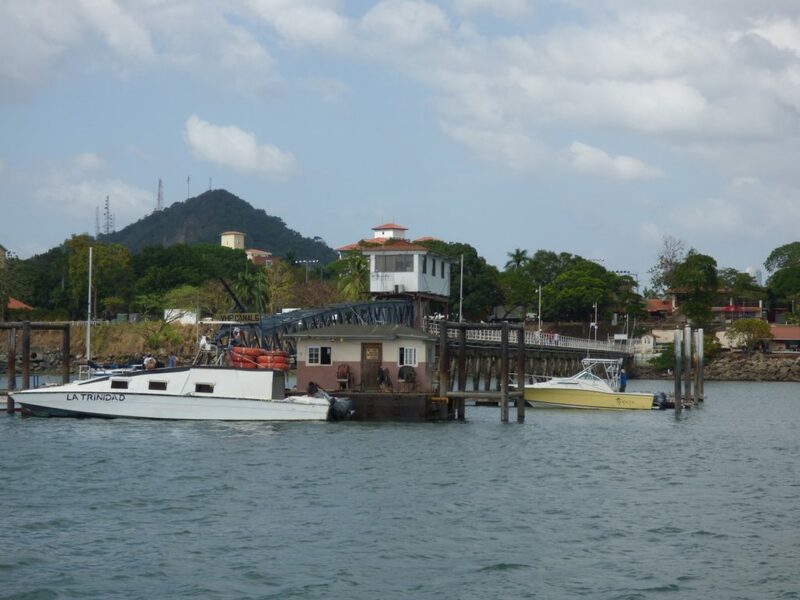 A regular ferry service runs between Amador Causeway and Taboga. As on the Caribbean side, there are usually many ships anchored at the entrance of the Canal to await their transit. 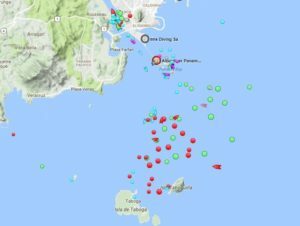 By now your Pilot would have disembarked as your vessel starts steaming southward towards the last (southern-most) channel buoy and the Pacific Ocean. 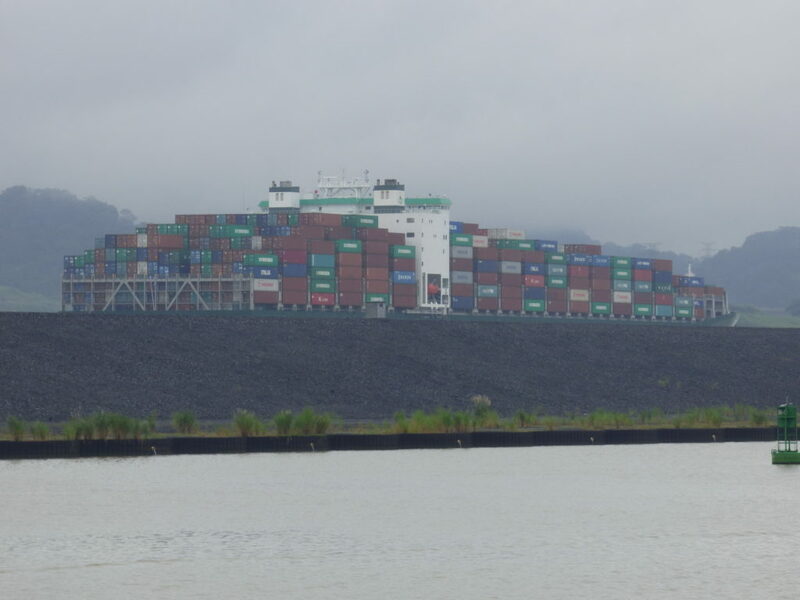 Congratulations, you have now transited the Panama Canal! You will probably see lots of ACP Ships and Boats working on the Canal.